We have had the Cobra XRS-9970G's on order since Cobra first announced it a few months ago. Over the past few years Cobra has started to change its reputation and produce some decent detectors. The Cobra XRS-9970G is priced at $249.95 and there is no competitors detector in this price range that offers all the functionality that you get with this unit. 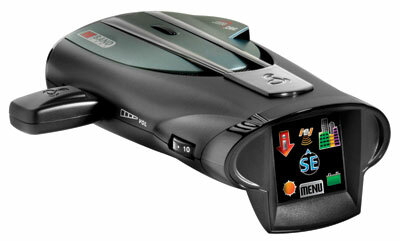 The Cobra XRS 9970G is the first touchscreen radar detector ever made. For a detector it las a large 1.5" LCD Display which is easy to see. As with the Cobra XRS-9960G it offers full band protection and also offers Cobra's GPS Locator which ebables the 9970G to warn you against verified Speed and Red Light Camera locations, dangerous intersections, and reported Speed Trap locations for entire United States and Canada. The included GPS Locator can also mark up to 1,000 User Programmable Location Alerts. Free Unlimited GPS Camera updates are included with the Cobra XRS-9970G for the life of the product.